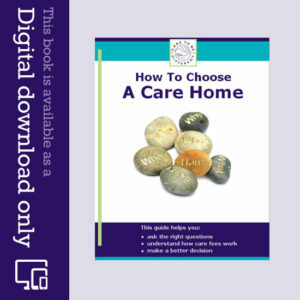 Care to be Different > Articles > Care homes > Already in a care home? If you have health needs, when you first go into a care home you should be assessed by the NHS for NHS Continuing Healthcare funding. 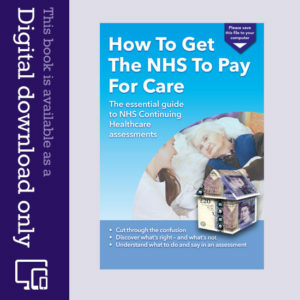 Elderly people in care homes who have health needs because of accident, illness or disability should be assessed for NHS Continuing Healthcare funding. 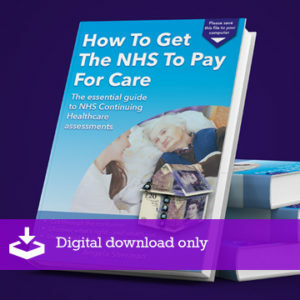 This should happen within the first three months of being in care – although ideally it should happen before you go into the care home, and certainly before you pay any care home fees. NHS Continuing Healthcare Funding is provided by the NHS and covers 100% of your care fees. If you haven’t been assessed for this, you can ask for an assessment. If you have been assessed, and it resulted in NHS Continuing Healthcare being denied, you can appeal. Read more about NHS Continuing Healthcare and Registered Nursing Care Contribution. In addition, if you’re paying for your own care and you were means-tested when you went into care, the value of any property you own should have been disregarded for the first 12 weeks of your care. My father has recently been assessed and turned down, unfortunately I wasn’t able to attend but a close family friend did. Briefly my father has dysphagia and has to be fed which takes up to an hour due to the unpredictability of choking. The assessor marked him down as it wasn’t a fully qualified nurse feeding him but a trained HCA. When I received the written document this wasn’t written in the document. The other conflicts around mobility he is unable to anything and is reliant on others for absolutely everything and has very limited communication. I have applied the framework to the assessment and there are so many conflicts which is really concerning particularly as other professionals didnt agree with the assessor. I have just completed the appeal highlighting the conflicts with relevant pages and sections. I have also written to his MP and completed a timeline which shows wrong dates with many silly but unprofessional errors. My question is this is there anything else I can do at this stage? Please can anyone advise me? My dad is in a care home and yesterday was attacked by a dementia patient in the home. My dad had FLD with Motor Neurone and is quite frail. Do I report to the police as an ABH incident? The attack should (at the very least) be properly recorded in the care home’s notes for your dad. There may need to be safeguarding enquiry – so it’s worth contacting the local authority’s adult care team. Also, ask the care home how they will ensure this does not happen again. If you feel no one is taking this seriously, you may want to involve other authorities, yes. With care homes, against live in carers, they have the correct facilities to provide you with full support. My 84yr old mother went into a care home from April 2015. She has had the NHS continuing healthcare assessment, and was sadly turned down! However, she does qualify for the nursing element – this to me is confusing, as if you qualify for nursing care, how can you not have a primary health need??? My mother is self funding – sold her home to pay her fees! She has a diagnosis of COPD and Asbestosis and brittle bones, she is on oxygen to assist her breathihg and cannot walk. Please can someone give some advise about this. 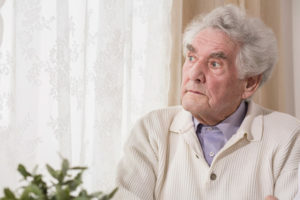 Sarah – this may help you: http://caretobedifferent.co.uk/continuing-healthcare-funding-and-choice-of-care-home/ I addition, if your grandfather has lost mental capacity to decide where he wants to go, there may need to be a Best Interests meeting. (Keep in mind that mental capacity is about making a specific decision at a specific time about a specific thing, rather than a general assessment of cognitive ability: http://caretobedifferent.co.uk/mental-capacity-assessments/) Also, if you google “best interests meetings” you’ll find information on how these should be carried out.